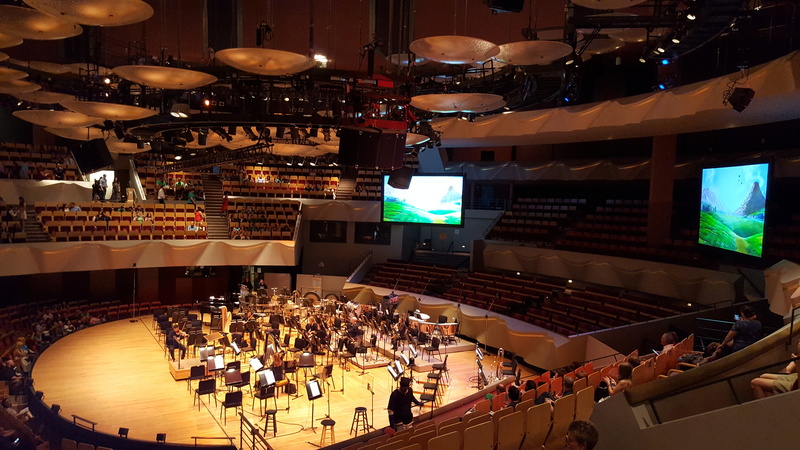 I had the chance to attend two different video game symphony performances over the last couple weeks: the Kingdom Hearts Orchestra World Tour in Hollywood and Zelda: Symphony of the Goddesses in Denver. Michaela already wrote about KH here, and this is my third time seeing Zelda live. The picture at top is a shot of the Dolby Theatre, where the concert took place. That’s the same venue where the Oscars happen, and it shows — the place is ridiculously ornate, with fine wood and nicely upholstered seating. (Sure, there are cheap-looking folding chairs on some of the balconies, but you gotta cut costs somewhere.) Couple that with the exclusivity and newness of the tour and it’s easy to see why tickets were so expensive. There was a murmur of excitement throughout the venue as seats filled in, and that exuberance carried over into the performance itself. The crowd reminded me of the first major video game concert in the States, which I also managed to attend: Final Fantasy Dear Friends, also in LA, back in 2004. Fans cheered whenever a character appeared on-screen for the first time, and broke into applause when Yoko Shimomura came on stage to speak in Japanese — then clapped again each time her translator explained what she said. The setlist was solid overall, with a few misses. Like the series as a whole, there was a little too much focus on the spinoff and side games and not enough attention paid to Kingdom Hearts I and II. The first half was stronger than the second, and the opening three numbers (Hikari, Dearly Beloved, Destati) were phenomenal. I got the feeling that there were a number of people who were seeing a video game concert for the first time (and some who had never been to a symphony before). That’s a good thing! The more the merrier. One of the dangers of fandom is really starting to like something and then circling the wagons, preventing anyone else from getting close to the thing you love. Me, I’m still amazed that video game music is being played in symphony halls across the country. That’s awesome, and I try not to ever forget that. Boettcher Hall is an in-the-round venue, which is awesome. The second time I got to see Muse in concert was the same setting, and I think it really adds something to the experience. One of the most important benefits is that good seats are easier to acquire; there are very few bad locations. We sat here, maybe 10 rows back, for less than $30. By the time the first violin took his seat, a little more than three-fourths of the seats were full. It was a pretty good crowd considering that the show wasn’t advertised all that well. The setlist was largely the same as other Symphony of the Goddess stops, with a few new additions: two full pieces from Breath of the Wild, and an encore focused primarily on Ballad of the Wind Fish from Link’s Awakening. All three additions were good, although you could argue that the show would have been better off ending on its final listed piece (a Link to the Past collection) than the two encores. There were a couple other small tweaks to existing pieces, like adding a short bit of Breath music to the opening medley. Either way, both were a blast to attend and I strongly recommend checking out a video game orchestra performance if it happens to wander through your town.